Our range of Traditional, Handmade Gluten & Wheat Free Steamed Puddings includes all time favourites - Rich Chocolate, Lashings of Lemon or Traditional Jam Pud. The Gluten Free Pudding range is produced using Doves Farm Gluten Free Flour. This is a blend milled from naturally gluten and wheat free rice, potato, tapioca, maize and buckwheat. For other flavours please contact us and we can prepare these for you to order. Gluten & Wheat Free There are 12 products. Black & Blue steamed pudding made using Gluten & Wheat free ingredients. Ickey Sticky Toffee steamed pudding made using Gluten & Wheat free ingredients. Delicious Chocolate Sponge & Rich Chocolate Sauce made using Gluten & Wheat Free ingredients. Sea Salted Caramel Steam Pudding made using Gluten & Wheat free ingredients. St Clements steamed pudding made using Gluten & Wheat free ingredients. 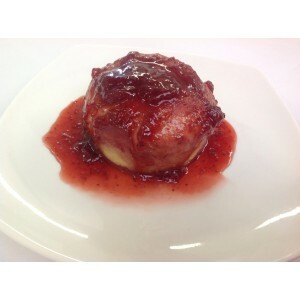 Jam steamed pudding made using Gluten & Wheat free ingredients. Worcestershire Treacle steamed pudding made using Gluten & Wheat free ingredients.